By some measures, Jewish men in Israel are more religiously observant than Jewish women. Among Haredim, Datiim and Masortim in particular, men are more likely than women to report that they pray several times a day and attend synagogue weekly. In part, this reflects the fact that Jewish law (halakha) requires daily prayer in a prayer quorum (minyan) for men and not for women, and halakha makes similar exemptions for women regarding many other mandated rituals. But the survey also finds that among Masortim, men are more likely than women to say religion is “very important” in their lives, and more Masorti men than women refrain from travel on the Jewish day of rest. 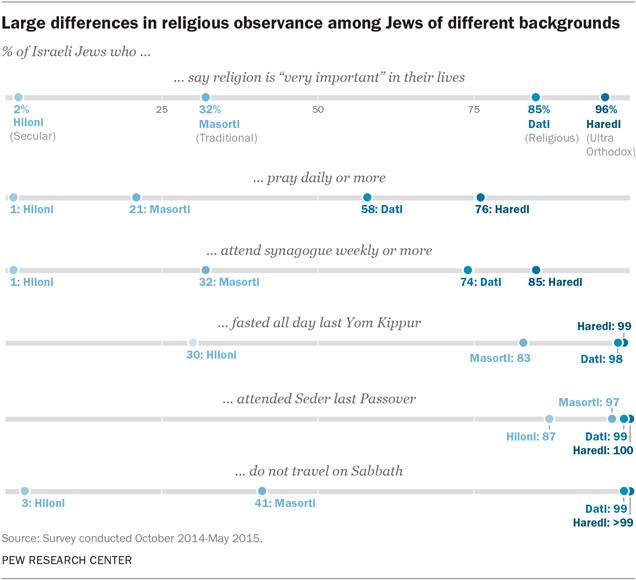 Among both highly religious and secular Jews, there are few differences in religious observance between older and younger Israeli adults. 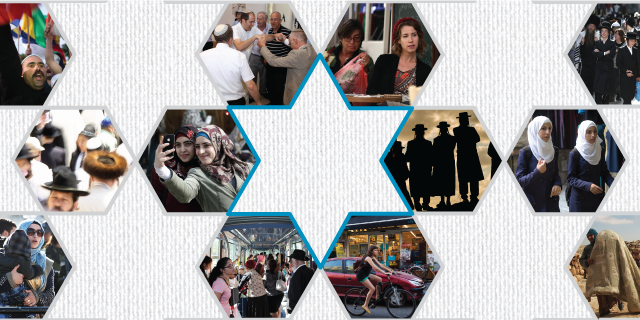 Chapter 4 looks at measures of religious commitment in Israel in more detail. 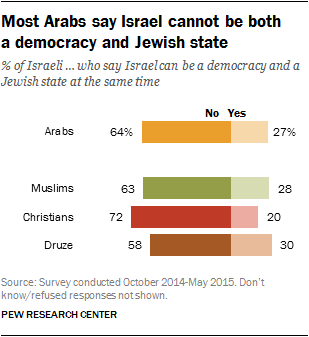 Arabs in Israel – especially Muslims – are more religiously observant than Jews as a whole. Fully two-thirds of Israeli Arabs say religion is very important in their lives, compared with just 30% of Jews. Israeli Muslims (68%), Christians (57%) and Druze (49%) all are more likely than Jews to say religion is very important to them, personally. In addition, more Arabs than Jews report that they pray daily and participate in weekly worship services. Generally, Muslims in Israel are the most religiously observant of the four major religious groups. For example, a majority of Muslims say they pray daily (61%), compared with 34% of Christians, 26% of Druze and 21% of Jews. And while 25% of Druze, 27% of Jews and 38% of Christians say they attend religious services at least weekly, roughly half of Israeli Muslims (49%) report that they go to a mosque on at least a weekly basis. Among Muslims in Israel, adults between the ages of 18 and 49 are generally less observant than their elders. For example, those under 50 are less likely than older Muslims to say they pray daily or attend mosque weekly. 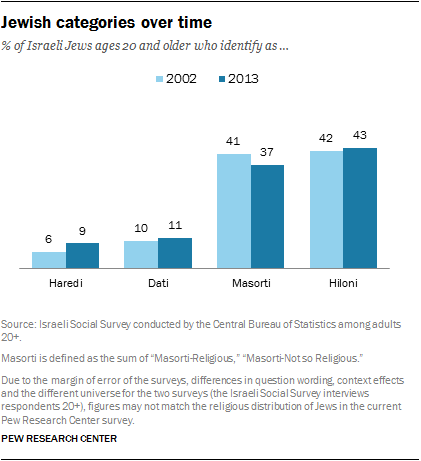 This is not the case among Jews; as previously noted, there are few, if any, significant differences in religious observance between younger and older Israeli Jewish adults. Data collected by the Israeli Social Survey on religious observance among all non-Jews in Israel – Muslims, Christians and Druze combined – show a net uptick in the proportion of adults who say they are “very religious” or “religious,” from 51% in 2002 to 56% in 2013. Over the same 11-year period, there has been a slight net decline in the proportion of non-Jewish adults who say they are “not so religious” or “not religious,” from 49% to 44%. Jews and Arabs of different religious backgrounds are separated by more than just their religiosity and political opinions. The survey finds that these groups are also relatively isolated from one another socially. This is even true within Israeli Jewry. Particularly among Haredim and Hilonim, few adults say they have many close friends from outside their own community, and intermarriage is rare. In addition, the vast majority of Haredim say they would not be comfortable if one of their children were, someday, to marry a Hiloni Jew – and vice versa. Masortim are the one Jewish group that is more likely than others to have close friends from a variety of other Jewish groups. 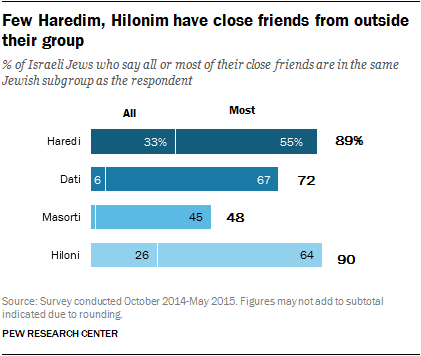 Only about half of Masortim (48%) say that all or most of their close friends are also Masortim; by comparison, among Haredim and Hilonim, roughly nine-in-ten adults say all or most of their close friends belong to the same Jewish subgroup. Among Datiim, 72% say all or most of their close friends are Datiim. Similarly, 95% of married Haredim say their spouse is also Haredi, while 93% of Hilonim who have a spouse or partner say that person is Hiloni. Datiim also are very likely to have a spouse who is Dati (85%). As with friendships, Masortim are most likely to have a marriage that crosses Jewish subgroups; 64% are married to another Masorti Jew, but roughly one-third are married to a Jew they describe as either Dati (20%) or Hiloni (15%). The vast majority of Haredim and Hilonim also are uncomfortable with the idea of future intermarriage between their two communities. About nine-in-ten Hilonim say they would be “not too” comfortable (20%) or “not at all” comfortable (73%) if their child someday married a Haredi Jew, while nearly all Haredi respondents (95%) say they would be “not too” comfortable (17%) or “not at all” comfortable” (78%) if their child were to someday marry a secular Jew. Haredim are also generally uncomfortable with the idea of their children taking a Masorti spouse (88% say they would be uncomfortable with this) or a Dati spouse (58%). On this hypothetical question, the divisions are less stark when it comes to some other groups that are adjacent to one another on the religious spectrum. Only a minority of Masortim say they would be uncomfortable with their child marrying either a Dati or Hiloni Jew. Similarly, minorities of Datiim indicate they are uncomfortable with the idea of their child having a spouse who is Haredi or Masorti. Hilonim are generally uncomfortable about the idea of intermarriage with Orthodox Jews – including both Haredim and Datiim. But fewer than half of Hilonim (45%) say they would be uncomfortable with the idea of their child having a spouse who is Masorti. Religious intermarriages cannot be performed in Israel (although civil marriages that take place in other countries are legally recognized in Israel).7 This is reflected in the rarity of marriages between members of different religious communities in the country. Nearly all Israelis in the survey who are married or living with a partner say their spouse or partner shares their religion. Relatively few married Muslim, Christian and Druze residents (1%) say their spouse has a different religion, and only 2% of married Jews say they have a spouse who belongs to a non-Jewish religion or is religiously unaffiliated. Not only is intermarriage rare in Israel, nearly all Israeli Jews and Arabs included in the survey say they would prefer their children to marry within their own religious circle. Among Jews, 97% say they would not be comfortable with their child someday marrying a Muslim, and 89% say this about their child ever marrying a Christian. Similarly, 82% of Muslims, 88% of Christians and 87% of Druze say they would be uncomfortable with the idea of their child marrying a Jew. Among Arabs, there is also uneasiness with marriage between religious groups. Three-quarters of Muslims say they are not too or not at all comfortable with the idea of intermarriage with a Christian. Similarly, most Christians (80%) say they would be uncomfortable with their child marrying a Muslim. Druze are about equally opposed to the idea of one of their children marrying a Jew (87% uncomfortable), a Muslim (85%) or a Christian (87%). Social divisions within Israeli society may be connected to perceptions of discrimination. Roughly eight-in-ten Arabs (79%) say there is a lot of discrimination against Muslims in Israel today, while just 21% of Israeli Jews share this view. Arabs also are more inclined than Jews to perceive Israeli society as discriminatory toward a variety of other social groups. For example, 40% of Arabs say there is a lot of discrimination against women in Israel today, compared with 25% of Jews who perceive a lot of discrimination against women. And just 9% of Jews say there is a lot of discrimination against secular Jews in Israel, compared with 21% of Arabs who say secular Jews face a lot of discrimination. The survey also asked about positive interactions. About a quarter of Israeli Muslims (26%) say a Jewish person has expressed concern or sympathy toward them in the past year because of their religious identity. And 15% of Christians and 18% of Druze say a Jewish person has expressed sympathy toward them in the last 12 months. Views on discrimination in Israel, as well as Jews’ views on anti-Semitism around the world, are discussed in detail in Chapter 12. Many Arab citizens or residents of Israel appear to be losing hope that a way can be found for Israel and an independent Palestinian state to coexist peacefully. In Pew Research Center polling, the percentage of Israeli Arabs who say a peaceful, two-state solution is possible has dropped by 24 points in just two years, from 74% in 2013 to 50% in the latest survey, which was conducted in late 2014 and early 2015 (i.e., even before the wave of stabbings and other violence in Israel and the West Bank in late 2015). The new poll finds that about three-in-ten Israeli Arabs (30%) think a peaceful two-state solution is not possible, while 20% say they do not know or do not take a position either way. As of the time of the survey, Israeli Jews were less optimistic than Israeli Arabs about the possibility of a two-state solution. Israeli Jewish public opinion had become more negative after the breakdown of peace negotiations in April 2014, then rebounded somewhat in 2015. The percentage of Israeli Jews who say a way can be found for Israel and an independent Palestinian state to coexist in peace has risen slightly from 37% in 2014 to 43% in the new survey. Opinion on this topic may continue to change as events unfold in the region. 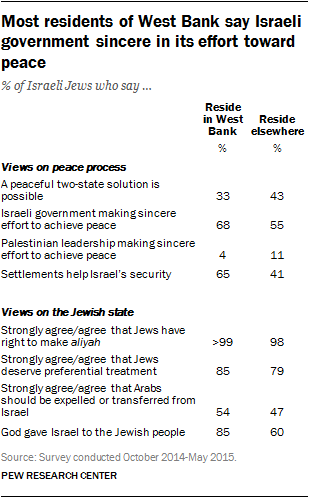 Among Jews, a slim majority of Hilonim (56%) say Israel and an independent Palestinian state can peacefully coexist. But among other groups, the prevailing view is that a peaceful two-state solution is not possible. Further statistical analysis finds that after controlling for religious identity (Haredi, Dati, Masorti, Hiloni) and other demographic factors such as age, gender and level of education, Israeli Jews’ opinions on the feasibility of a two-state solution are most closely tied to their political ideology. Among the small proportion of Jews who say they are on the left side of the ideological spectrum, 86% think a way can be found for Israel and an independent Palestinian state to coexist peacefully together, compared with 29% of those on the political right and 46% of those in the center. Israeli Jews express a wide range of views on the construction of Jewish settlements – especially in the West Bank – which continue to generate controversy internationally, including recent moves by the European Union to label goods produced in the settlements. Currently about 4% of Israeli Jews live in the West Bank (not including East Jerusalem). A plurality of all Israeli Jews surveyed (42%) say the continued building of settlements helps the security of Israel, while three-in-ten (30%) disagree, saying the settlements hurt Israel’s security. A quarter of Israeli Jews (25%) say the settlements do not make a difference one way or another with respect to Israel’s security. Datiim are more likely than the other major Jewish subgroups in Israel to favor the settlements; about two-thirds (68%) of Datiim say settlements help Israel’s security, and only 13% say they hurt the country’s security. Fully half of Haredim and 45% of Masortim agree that the settlements help Israel’s security, while fewer (13% of Haredim and 22% of Masortim) say they hurt. But Hilonim lean in the other direction: About four-in-ten Hilonim (42%) say settlements in the West Bank hurt Israel’s security, while 31% say they help, and the rest think they do not make much difference or do not take a position either way. Israeli Jews’ opinions about settlements are strongly tied to their political ideology. Only 13% of those on the left side of the ideological spectrum say the building of settlements helps the security of Israel. Among those on the right, by comparison, 62% say the continued building of settlements helps the security of the country. 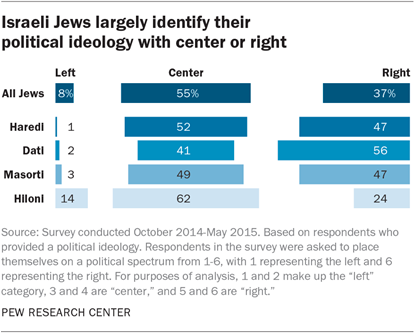 Israeli Jews who place themselves in the center of the ideological spectrum are evenly divided when it comes to this issue. The same proportion of political centrists (32%) take each of the three possible stances: that settlements help the security of Israel, hurt the country’s security or make no difference one way or another. A majority of Israeli Arabs (63%) say that settlements hurt Israel’s security, including most Muslims (61%), Christians (79%) and Druze (66%). For more details on this and other topics pertaining to the peace process, see Chapter 9. Overall, West Bank residents are far more religious than other Jews. A solid majority of Jewish respondents who live in the West Bank (63%) are Orthodox, including 26% who identify as Haredim and 36% who identify as Datiim. 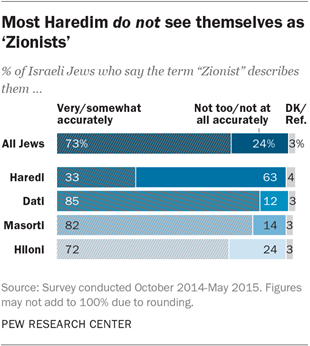 By comparison, 9% of Jews who live in other regions are Haredim and 12% are Datiim. Consequently, settlers are far less likely than Jews living elsewhere in Israel to identify as Masortim or Hilonim. 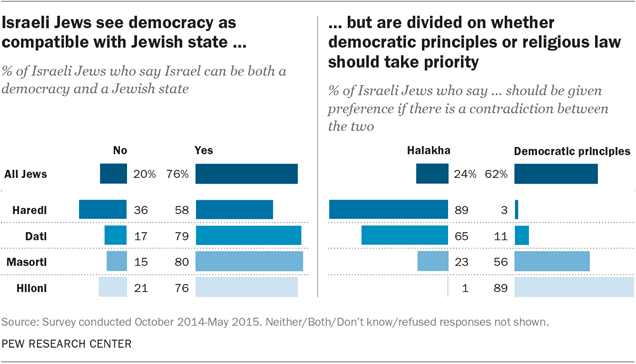 These religious differences are evident when it comes to views about Israel. Fully 85% of settlers, including a nearly universal proportion of Haredi and Dati settlers (>99%), say God gave Israel to the Jewish people, while a much smaller majority of other Israeli Jews (60%) express this view. Overall, residents of the West Bank are less optimistic than Jews who reside elsewhere that a way can be found for Israel and an independent Palestinian state to peacefully coexist (33% vs. 43%). At the same time, settlers are more likely than other Israeli Jews (68% vs. 55%) to say the Israeli government is making a sincere effort to reach a peace agreement. Fewer settlers than other Jews say the Palestinian leadership is sincere in its efforts toward peace, although relatively few Jews, regardless of location, see Palestinian leaders as sincere in this regard. While settlers have somewhat different views on the peace process than other Israeli Jews, they generally take similar positions on questions concerning the rights of Jews and Arabs in Israel. For example, nearly universal shares of both groups say Jews around the world should have the right to move to Israel and gain citizenship. And roughly half of both groups agree that Arabs should be expelled or transferred from Israel, although settlers are somewhat more likely than other Jews to strongly agree with this statement (27% vs. 20%). Overwhelming majorities among both West Bank settlers (85%) and other Israeli Jews (79%) agree or strongly agree that Jews deserve preferential treatment in Israel; again, more settlers than Jews living elsewhere strongly agree with this view (57% vs. 47%). Among settlers, those who are Orthodox (Haredim and Datiim combined) are considerably less optimistic than are non-Orthodox (Masorti and Hiloni) settlers about the prospects for a peaceful two-state solution (23% vs. 50%). Roughly one-third of Masortim and Hilonim who reside in the West Bank (35%) agree that Arabs should be expelled or transferred from Israel, compared with 65% of Haredi and Dati settlers who take this view. Most members of all the main religious groups in Israel place great importance on family, education and career. But even within these areas of general agreement, there are some substantial differences. For example, while virtually all Hilonim (99%) say that giving their children a good general/secular education is important to them, a much smaller majority of Haredim (69%) say the same. And the opposite is true when it comes to giving children a good religious education: Nearly all Haredi respondents (>99%) say this is either “very important” or “somewhat important” to them; about half of Hilonim (54%) agree. Haredim are less likely than other Jews in Israel – as well as other religious groups – to value a high-paying career or the opportunity to travel around the world. Only about two-thirds of Haredim (68%) say being successful in a high-paying career is important to them, compared with roughly nine-in-ten Datiim, Masortim and Hilonim – as well as nine-in-ten Muslims, Christians and Druze. Relatively few Haredim (16%) say it is important to them to travel the world, while roughly seven-in-ten secular Jews in Israel (69%) say they value such opportunities. The survey asked respondents to say, in their own words, what they see as the single biggest long-term problem facing Israel. About four-in-ten Israeli Jews cite economic issues (inequality, rising housing costs, etc. ), and a roughly equal number name various security-related issues (violence and terrorism, the threat from Iran, etc.) as the biggest problem. Arabs, meanwhile, are more likely to mention economic issues than any other type of response. In 2013, U.S. Jews were also asked to name the biggest long-term challenge facing Israel, and almost none (1%) mentioned economic problems, while two-thirds cited various security issues as the biggest long-term problem facing Israel. About one-third of Jewish men say they wear a kippa or other type of head covering in public. The type of kippa varies by Israeli subgroup, with Haredi men more likely to wear a black fabric kippa and Dati men more likely to wear a crocheted kippa (often with a pattern or color). One-in-five Israeli Jewish women also say they wear a head covering in public (either a wig, snood, scarf or hat). After the fall of the Soviet Union, an influx of Jews from former Soviet republics arrived in Israel during the 1990s, forming a large cohort that was notably less religiously observant than Israeli Jews overall. Many of these immigrants now have children who were born in Israel, and there are signs that members of this second generation – that is, Israeli Jews with at least one parent who was born in the former Soviet Union – are more religious than their parents (although still not as religious as Israeli Jews overall). For example, 70% of these second-generation immigrants say they believe in God, which is higher than the 55% of first-generation former Soviet immigrants who express belief in God. Israeli Jews are roughly evenly divided between two types of ethnic identity: Ashkenazi Jews (with ancestral roots in Central and Eastern Europe) and Sephardi or Mizrahi Jews (with roots mostly in Spain, elsewhere around the Mediterranean or the Middle East). Haredim and Hilonim are more likely to identify as Ashkenazi Jews, while Datiim and Masortim are more likely to identify as Sephardi/Mizrahi Jews. While Muslims living in Israel, overall, are more religious than Israeli Jews, they are less religious than Muslims living in many other countries in the region. For example, about two-thirds of Muslims in Israel (68%) say religion is very important in their lives – higher than the comparable share of Lebanese Muslims (59%), but lower than the share of Muslims in Jordan (85%), the Palestinian territories (85%) and Iraq (82%) who say this. • The share of Jews in the total population has been declining, while the share of Muslims in the population gradually has been rising. • Among Jews, the share who are Orthodox has been slowly rising, largely as a result of high fertility rates among Haredim. • Surveys conducted over time indicate a modest decline in recent years in the share of Israeli Jews who report moderate levels of religious observance. The reported decline of what might be called the “religious middle” suggests that Israeli society may be becoming more religiously polarized. According to Israeli census data, the country’s religious landscape has been gradually changing, with a falling share of the population identifying as Jews and a rising share identifying as Muslim or choosing not to identify with any of the four main religious groups (Jews, Muslims, Christians and Druze). In 1949, shortly after the establishment of the state, the first Israeli census found that 86% of the total population was Jewish, 9% was Muslim, 3% was Christian, and 1% was Druze. As of 2014, the Muslim proportion of the population has doubled to 18%, while the Jewish proportion has declined 11 percentage points, to 75%. The Christian share of Israel’s population also has declined, falling from 3% to 2%, while Druze have risen from 1% to 2%. 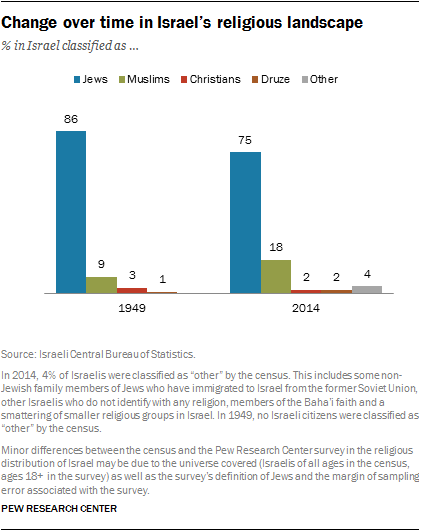 At the same time, a growing share of Israelis (4% in 2014) do not identify with any of these religious groups and are classified as “other” by the census. This includes some non-Jewish family members of Jews who have immigrated to Israel from the former Soviet Union, other Israelis who do not identify with any religion, members of the Baha’i faith and a smattering of smaller religious groups in Israel. 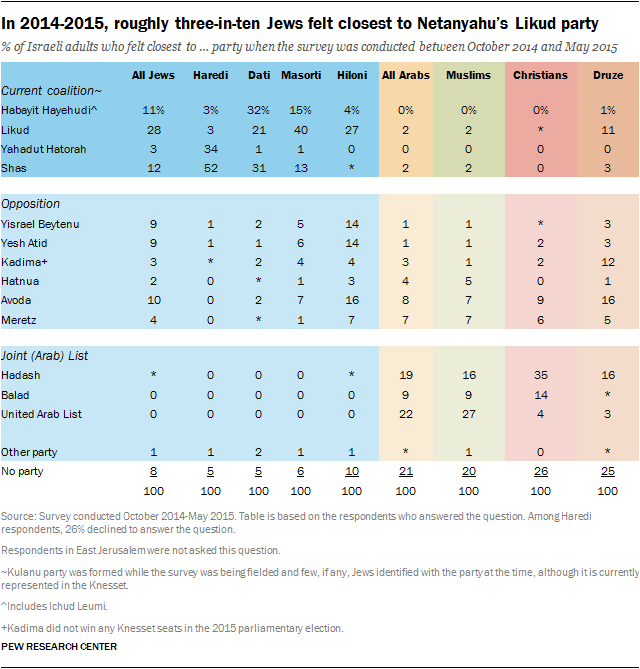 Among Jewish groups, Haredim have experienced the biggest gain over time. In the 2013 ISS, 9% of Israeli Jewish adults identified as Haredi, up from 6% a little more than a decade earlier. As a result of differences in fertility rates, Hilonim form a smaller share of Jewish adults under 30 years of age (44%) than they do of Jews ages 50 and older (52%). Among Jews between the ages of 18 and 29, 12% are Haredi, compared with 8% among those ages 50 and older. Previous polls conducted by Pew Research Center, the Guttman Center for Surveys at the Israel Democracy Institute and the former Guttman Institute indicate a decline in recent years in the share of Israeli Jews who report moderate levels of religious observance. Comparing the results of the current survey with previous research by the Guttman Center and the former Guttman Institute shows that the share of Israeli Jews who say they follow some of the Jewish tradition has fallen to about one-third (34%), down from four-in-ten or more in Guttman surveys conducted between 1991 and 2009. The decline of the middle has been accompanied by a recent rise in the proportion of respondents who say they follow none of the Jewish tradition, while respondents who say they follow all or most of the tradition is essentially unchanged since 2009. A similar trend is seen on a question about religion’s importance in people’s lives. Since 2007, when the question was last asked in a Pew Research Center survey, the share of Israeli Jews who say religion is “somewhat important” in their lives has decreased from 36% to 26%, while the proportion who say religion is “very important” in their lives has increased from 24% to 30%. The share who say religion is “not too important” or “not at all important” in their lives also has increased somewhat, from 38% in 2007 to 44% in the new survey.